Let’s face it, there are many not so good things about getting older. … and those are just a few! Many years ago, a church we attended had a guest speaker on a special Sunday to honor the seniors in our congregation. This man was one who was loved by the congregation, and was, himself, over seventy years. It was the most depressing sermon I have ever heard in my entire life! I do not remember the passage of scripture he used in his teaching, but it and his reflections on it were all about how awful it was to grow old. Sitting here in the mid-stage of life (obviously I am counting on more than the average number of years of life) I feel as though his approach was far too ‘cup half full’ for me. Not everything about the process of moving on in time is bad. 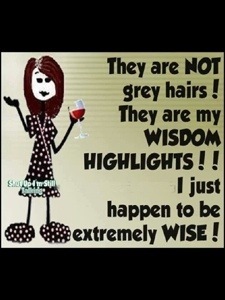 graying hair means we can be a blond one month, followed by a brunette the next, followed by a redhead the next … or let it all gray and look like the wisest person in the room! skin thinning … heck, that means it will get smoother! I believe in purpose until our dying breath. I believe value is not determined by our productivity but by who give us the ability to produce.